How have I put this off? A tour. Of a candy factory. Locally. 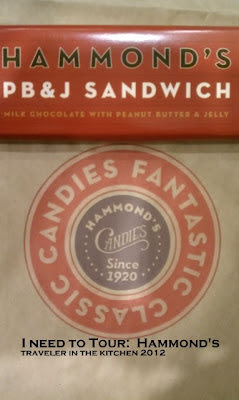 I have lived in Denver for almost seven years and I feel bad that I haven't yet taken a tour of Hammond's Candies. I love a food tour, from the Jelly Belly plant in California to Ben & Jerry's in Vermont. I was reminded of Hammond's in the airport a little over a week ago because there is a little kiosk of candy calling me. Including this PB&J Sandwich chocolate bar that I savored while waiting out a two hour flight delay. This, along with free Direct TV on the flight to watch the Olympics, saved the day! Posting it here, I can hold myself accountable. I, Jenni, the Traveler in the Kitchen, pledge to tour the Hammond's factory by the end of the year. What's the best factory tour you've ever taken?